Roy's in Eastern California. 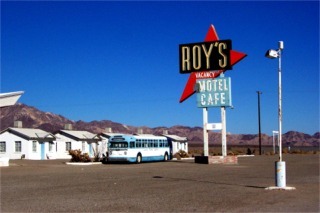 Roy's is a barren old motel/gas/cafe stop at Amboy. The motel sign is one of the most photographed Route 66 artifacts there is, one you have likely seen before. The Brad Pitt (!) flick, Kalifornia, was filmed in part here, When we stopped there they were working on the gas lines. A woman traveling with us had to use the bathroom and the owner told her to use the desert. Never mind the fact that there wasn't another facility around for 30 to 50 miles. He wasn't open and if he let her use it he would have to clean the restroom and he didn't make any money from it. I offered to pay him but that wasn't good enough for the greedy *****. A friendly sort. Needless to say he will NEVER get a penny of my money. 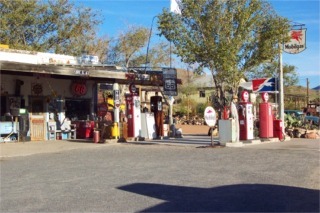 This was until recently called the Hackberry International-Bioregional Old Route 66 Visitors Center. It is now the Hackberry General Store. It was owned and run by Bob Waldmire and boasted free cold water to travelers. Bob came from Springfield Illinois where his father invented the Cozy Dog. You may know it as a corn dog. He sold the place in 1999. The new owners have cleaned it up a bit and it still retains it's character and charm. Bob went back to Springfield to write his fathers life story. Snow Cap in Seligman Seligman is the beginning of the remaining 158 mile stretch of Old Route 66 to Topock. 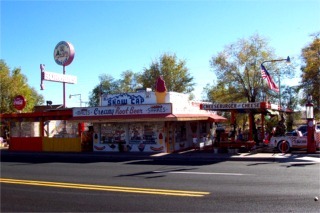 There are many sites to see like the Snow Cap, the Harvey House, pool hall and Delgadillo's Route 66 Gift Shop in the old barber shop building. 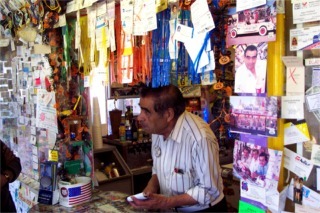 Angel Delgadillo who runs the barber shop is one of the driving forces behind the the rebirth of route 66. This is Juan Delgadillo the clown prince of the Snow Cap. Be careful what you ask for you might get it. Ask for Ice cream and you may get just that, a cone filled with ice and cream on top. Or, a small coke can be a small ice cream sample cup filled heaping with ice and a small amount of coke in it. I have heard him asking "I got to know do you want cheese on that cheese burger?". Juan and his son Robert keep the place alive with the practical jokes. If you ask for a straw you may get a bundle of hay. 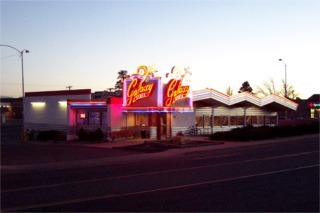 This is a picture of the Galaxy Diner in flagstaff. Every time I am in Flagstaff I like to eat here. They have wonderful deserts but normally after I have eaten dinner there isn't enough room for desert. I couldn't find any history and it is too new to be from the rt 66 days but.... hey, I put it here.